Successfully competing in the world of stock photos requires great ideas, superior execution, and effective distribution. 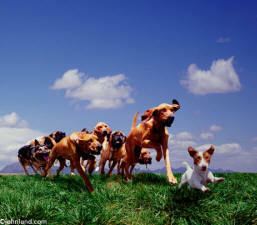 Small dog is the leader of the pack! Successfully competing in the world of stock photos requires great ideas, superior execution, and effective distribution. In this article we will take a look at the “ideas” part of the equation. Having a great idea is the foundation of stock photography production, as it makes both the execution and the distribution easier. If you have an idea that is needed in the market place and gets you excited about doing it, it is hard to imagine that you won’t do well. Great ideas combined with superior execution will certainly make getting distribution easier. Coming up with great ideas is a simple, three-step process: Intention, practice and retention. Increasing both the quality and the quantity of ideas begins with intention. I can read the newspaper and possibly come up with an idea, or I can clearly set the intention to come up with an idea from that newspaper and it almost becomes impossible not to come up stock ideas. I often set the intention to come up with stock ideas in a wide variety of situations. In a way it becomes a fun game for me. If I am driving somewhere I will sometimes decide that I am going to get a great idea on my way. My destination becomes more than just a physical location; my destination also becomes a step towards by continued success in producing stock images. In one example, I was on my way to my studio in commute traffic. It was unusually bad traffic and I was stuck at a crawl. I set my intention to make that time productive by coming up with an idea that would be conceptual, timeless, and needed in the market place. At one point the radio traffic reporter mentioned that there was construction work being performed on the freeway interchange ahead, and that was where the bottleneck for traffic was. 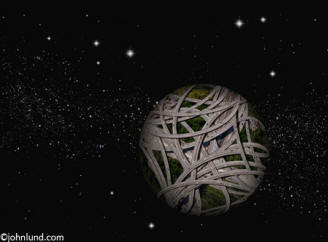 Immediately I had in my mind a birds-eye-view of the freeway with several lanes narrowing down into one. A bottleneck! A perfect metaphor for almost any kind of blockage, whether that blockage was about bandwidth restrictions on the internet, internal problems within a business hierarchy, or even physical restrictions on the delivery of goods. 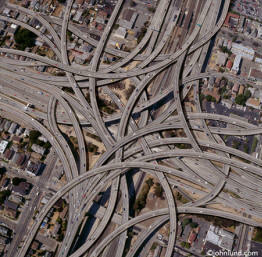 A second idea quickly popped into my head; I could make the interchange, or cloverleaf, into an insanely complex one! It wasn’t long before I had rented a helicopter, shot a freeway cloverleaf over Oakland, California and created three separate timeless, relevant, and conceptual stock images. It is hard to separate ideas from creativity; foster creativity and you will foster the generation of ideas. Strengthening your ability to be creative and to come up with ideas is like strengthening a muscle. The more you use a muscle the stronger it will get. The process may not happen overnight, but if you consistently work at it you will get better. In other words, you need to practice. Practice is choosing a source of inspiration and then working it, gleaning new insights and approaches. There are endless sources of inspiration all around us. Above I described my use of a radio program. I also find any source of visuals to be helpful whether it is a bookstore, magazine rack or even Internet searches. It is important not to copy an idea or visual, but to use it as a springboard to your own unique visual interpretation. While browsing an online stock photo collection, a picture of a beautiful tropical island surrounded by the sea, caught my eye. As I was headed soon for a shoot in Brazil, I was looking for ideas that would be appropriate for just such a tropical climate. As I thought about that island I tried to think of how I could do one differently. I thought about what concepts such an island could illustrate. The thought of a small, deserted, Tropical Island brought my attention to images of isolation and of castaways like Robinson Caruso. There was my idea! 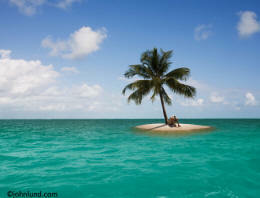 A castaway, dejectedly sitting on a small, really small, desert island with only one Palm tree on it. While the idea was fostered by someone else’s image, it was an entirely new picture and in no way infringed on the image that inspired it. In addition, the image is highly conceptual and timeless as well. In the practice of coming up with ideas here is an exercise that I find comes in handy. Think of the opposite. 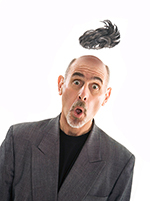 Turn the idea you are thinking of around 180 degrees. 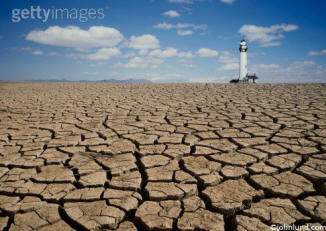 An example of where that might lead can be seen in the image of a lighthouse rising above a vast expanse of dry, cracked earth. While going over my archive of images I came across a lighthouse picture. I paused for a moment thinking about what new image I could create from this photo. My 180-degree exercise popped into mind and I had a mental picture of a lighthouse sans water. In this case, with the help of Photoshop, I was able to take a common image, a lighthouse, and transform it into a one-of-a-kind stock picture that speaks of global warming and other conservation and ecological ideas. Another exercise I find handy is to keep a list of concepts handy. Then, I can pick an image I am schedule to shoot, and scan the list of concepts in relation to that upcoming shoot, or shoot idea. Often one of those concepts will suddenly create a possible image where there was none before. My “leadership” image was the result of just such an exercise. In that image, I was scheduled to shoot some dogs for a greeting card assignment. Before the shoot I scanned my list of concepts. When I saw the word “leadership” the phrase “leader of the pack” popped into my head and I had a great stock photo idea! The final part of my recipe for finding ideas for stock is retention. Ideas can be fragile and fleeting things. I always keep a paper and pen handy and when I get an idea I write it down (OK, a pda or some such device will work too). I have learned from much experience that if I don’t write it down there is a better than even chance that the idea will be gone, if not forever, then at least for a lengthy period of time. It is also wise not to judge your ideas. Just write them down. You can judge them later. I have found that I will have a great idea, and then read it later and realize that, well; it wasn’t such a good idea after all. And then still later I may realize that it really was a great idea. I keep my list of ideas forever. When the well runs dry I can refer to my list and if I can’t find an idea that I want to create, at least those ideas can serve as a starting point for the generation of new ideas. It can sometimes be just taking an existing idea, even one I have done before, and giving it a new twist. Recently I went back and looked at the oldest of my ideas list, a list I hadn’t revisited literally for years. As I scanned down the words I came across an idea I had forgotten all about, but that now jumped out at me as not only doable, but one which I couldn’t believe I hadn’t done yet! 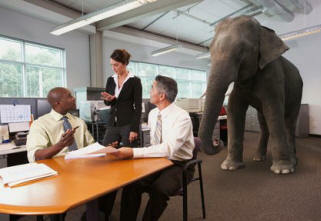 I had the idea of an elephant in a room being ignored by a meeting of business people, but at the time couldn’t wrap my ahead around how to do it, so the idea was archived on my list. Now, years later, I realized I had plenty of elephant images in my files, photos I hadn’t had before, and that I was about to do a shoot of business people in a office setting! If I hadn’t gone back over the list, the elephant in the room idea might not ever have manifested, or at least, might have taken me years to get back around to. Write your ideas down. Keep pen and pad, or a voice-recording app for your cell phone, or whatever it takes, around at all times. Ideas are slippery things, and can fly away as quickly as they come. Sometimes an idea isn’t possible to do now, but may become possible later. Sometimes current events will bring new life to an old idea. There is no such thing as a bad idea, only ideas that haven’t fully matured. Keep all of your ideas, and then review those lists from time-to-time or as needed. The payoff can be impressive. Setting the intention to come up with an idea, consistency in the practice of coming up with ideas, and recording those ideas for further review and reflection, will insure that you have the basic building block for success in the stock photo business.